Over the summer, I shot some environmental portraits for a publication called Satellite Magazine. The purpose of the article was to explore what impacts gentrification in Brooklyn is having on area barber shops. 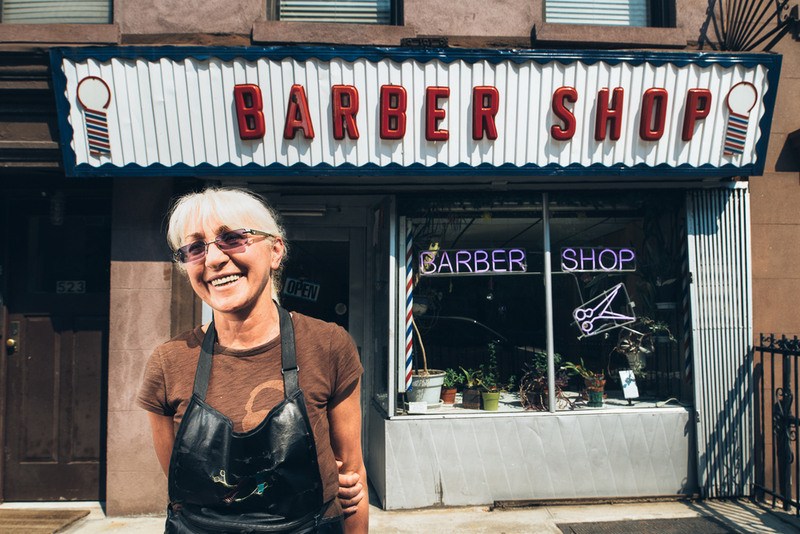 So, one Saturday we traversed the Brooklyn neighborhoods of Carroll Gardens, Gowanus, Prospect Heights and Crown Heights with the goal to interview and photograph owners of a cross section of barber shops. Shown below are tearsheets from the article. The two portraits below are my favorites from the shoot so I've included them separately so that they can be viewed full screen. Lana is actually my barber. She is a wonderfully sweet woman that always gives me Christmas gifts and even a bottle of wine for celebrating my wedding last year. She also adores Buddy, my golden retriever. Whenever I'm walking Buddy near her shop, I pop in and she immediately abandons her clients, mid-haircut, to rub Buddy's tummy for at least 5 minutes! Henry was an interesting guy. A former political prisoner of Castro, he came to NYC and has been cutting hair 66 years which is astonishing in itself but factor in that he is 78 which means he has basically had a pair of scissors in his hand since he was a boy. His wife was heckling him from across the street when this photo was taken. And for anyone interested in how this series was shot, all photos were taken with a 24 mm tilt-shift lens so that I could meticulously compose given the limited space available and the lighting was achieved with an Elinchrom Ranger Speed AS power pack and S-head with 39" deep octa soft box.